From Now Until Mid-December, Expect One Thing from the LHC: More Collisions. Quick post today. 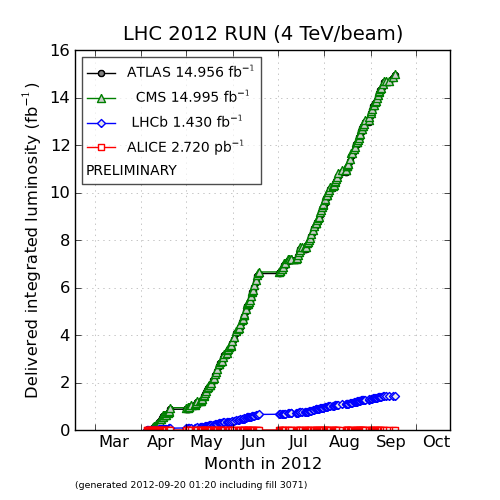 That plot above represents the amount of 8 TeV data collected by the LHC experiments. As of this month, the ATLAS and CMS detector experiments have each collected 15 fb-1 of data. A single fb-1 (pronounced: inverse femto-barn) is equivalent to 70 trillion proton-proton collisions. In other words, ATLAS and CMS have each observed 1,050,000,000,000,000 proton-proton collisions. That is 1.05 thousand-trillion, or 1.05×1015. To understand how gargantuan a number this is, consider that it took the LHC’s predecessor, the Tevatron, 24 years to deliver 12 fb-1 of proton-antiproton collisions*. The LHC has collected this much data in five months. Furthermore, proton-proton collisions will officially continue until at least December 16th, at which time CERN will shut off the collider for the holiday season. Near the beginning of the calendar year, we can expect the LHC to collide lead ions for a while before the long, two-year shut down. During this time, the LHC magnets will be upgraded in order to allow protons to run at 13 or 14 TeV, and the detector experiments will get some much-needed tender loving care maintenance and upgrades. To estimate how much more data we might get before the New Year, let’s assume that the LHC will deliver 0.150 fb-1 per day from now until December 16th. I consider this to be a conservative estimation, but I refer you to the LHC’s Performance and Statistics page. I also assume that the experiments operate at 100% efficiency (not so conservative but good enough). Running 7 days a week puts us at a little over 1 fb-1 per week. According to the LHC schedule, there about about 10 more weeks of running (12 weeks until Dec. 16 minus 2 weeks for “machine development”). By this estimation, both ATLAS and CMS will have at least 25 fb-1 of data each before shut down! 25 fb-1 translates to 1.75 thousand-trillion proton-proton collisions, more than four times as much 8 TeV data used to discover the Higgs boson in July**. Fellow QDer Ken Bloom has a terrific breakdown of what all this extra data means for studying physics. Up-to-the-minute updates about the LHC’s performance are available via the LHC Programme Coordinate Page, @LHCstatus, and @LHCmode. There are no on-going collisions at the moment because the LHC is currently under a technical stop/beam recommissioning/machine development/scrubbing, but things will be back to normal next week. * 10 fb-1 were recorded each by CDF and DZero, but to be fair, it also took Fermilab about 100 million protons to make 20 or so antiprotons.